A delegation of Syrian ‘rebels’ has made a deal with Kosovar authorities to exchange experience of ‘partisan’ warfare. Syrian Jihadis are sending militants to Kosovo to study the terror tactics of the KLA, the Kosovo-Albanian murder gang that continues to ethnically cleanse and kill Serbs and other minorities. On the 26th of April, a delegation of Syrian Islamic extremists visited Pristina (on their way back from the U.S.) to hold talks on how to make use of the experience of the Kosovo Liberation Army (KLA) in Syria. So far, a poorly-organized Syrian ‘opposition’ has proven unable to self-organize and form a steady front against the forces of President Assad. Terror tactics used by militants allow them to kill military and governmental officials, but do not help to hold positions against a regular army. Syrian rebel leaders have promised to immediately recognize Kosovo once they seize power in the country- “We’re in vital need of joint actions as a coalition opposition,” stressed Ammar Abdulhamid, a long-time opponent of the Syria’s President Bashar Assad. In 2005, he left Syria to settle in the US. 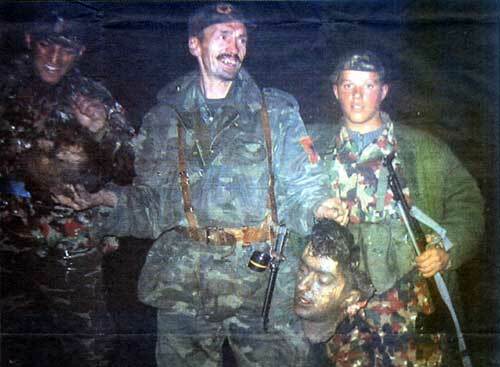 KLA butchers pose with the severed head of a Serb civilian. Beheading seems to be a common tactic of such extremists. The training camp on the Albanian-Kosovo border that has welcomed Syrian attendees was originally organized by the United States (particularly the CIA) to help the KLA train it’s terrorist members. The KLA was considered a terrorist organization by the US, the UK and France for years until, in 1998, it was taken off the list of terrorists with no explanation given. The KLA used to have up to 10 per cent of underage fighters in its ranks, have committed numerous war-crimes, are the leading heroin importers and people traffickers in Europe, have links to the Provisional IRA and, perhaps most worryingly, close ties to Al-Qaeda, Hamas and ISIS. That Jihadis are being trained in Southern Europe by experienced KLA terrorists should be a matter of concern for European governments. One would expect however, that the UK government will not show any such concern, indeed it will be a miracle if the British government or mainstream Media even makes reference to the situation in the Balkans. After all, it was the UK government, the United States and their NATO proxies that turned a blind eye to the KLA’s war-crimes and atrocities. For reasons unknown, ‘the West’ decided to take sides in the various Balkan conflicts of the 90s. They took up a virulent Anti-Serb position and backed Islamic militants, first in Bosnia, then in Kosovo. No doubt they will continue to back their KLA puppets, even if that means ignoring the KLA’s increasingly close relationship with ISIS and other extremist groups. A large number of Kosovo-Albanians, many of them former KLA terrorists, have gone to Syria and Iraq to join up with ISIS. As of today, it is estimated that at least 160 Kosovars have been killed whilst fighting in Syria, Iraq and Kurdistan. There are hundreds more still alive and active, committing atrocities in those countries. 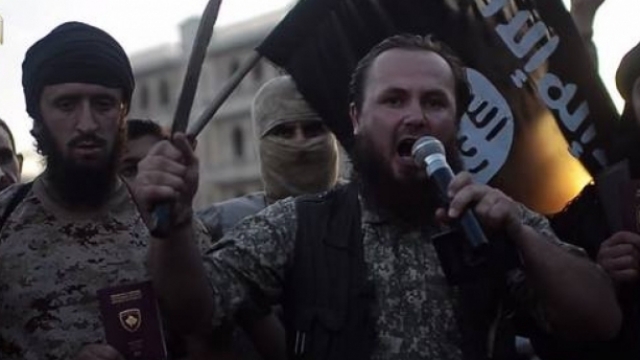 Kosovo has become a significant breeding ground for the global jihad. Europe was repelled when, on the 31st of July, a Kosovar in the ranks of ISIS, Lavdrim Muhaxheri, posted photographs on his Facebook page of himself decapitating a Syrian soldier. Muhaxheri has a history in Kosovo of supporting extremists in Syria. On the 12th of May, the Kosovo daily web-portal Express, in a report by its intrepid investigator of radical Islam, Visar Duriqi, said that Muhaxheri had worked in the official Kosovo Islamic Community apparatus in Kacanik, a city near the southern Kosovo border with Macedonia. In Facebook posts before his atrocity photo was posted, Muhaxheri claimed he controlled the appointment of the imam at the Central Mosque in Kacanik, which has become a center of conflict between Islamist radicals and local traditional Muslims. Islamic extremist Muhaxheri threatened to kill Kacanik clerics as well as politicians and public figures in Kosovo who denounced incitement of young Albanian Muslims to fight in Syria. Another Kosovar, Blerim Heta, blew himself up in Baghdad, killing over fifty people. Heta did not fit the ‘normal profile‘, in that he came from an intact family that was not poor, had no criminal record, and was employed (in fact he worked at Camp Bondsteel, the main US Army base in Kosovo); He attended sermons by Shefqet Krasniqi, the popular imam at Prishtina’s Grand Mosque, who praised the martyrdom of the first Albanians to die in the Syrian jihad. It is clear that, unsurprisingly, Kosovo has become a fertile recruiting ground for the Jihadists. Furthermore, the Kosovar ‘government’ [such as it is] is amenable to the extremists and is quite prepared to allow Jihadi fighters to use Kosovo as a training camp and base of operations. What will it take before ‘the West’ opens its eyes to the reality of Kosovo, the KLA, and the real agenda of the Kosovo-Albanian Mafia state. Perhaps some will only open their eyes when some fresh terrorist atrocity is visited upon a European city. Maybe then the people of Europe and North America will wake up and ask their rulers why they sided with Islamist Kosovo-Albanian separatists and stole that province away from the Serb people, handing it over to the KLA heroin dealers and slave traders.